AP PECET 2018 Results Physical Education entrance 2018 Results appecet.org.in, AP Physical Education Entrance Test 2018 Results/Rank cards. A Common Entrance Test designated as Andhra Pradesh Physical Education Common Entrance Test (APPECET - 2018) will be conducted by Acharya Nagarjuna University for the academic year 2018-2019 for seeking Admission into B.P.Ed. (2 Years) and U.G.D.P.Ed(2 Years) Courses. The Application form is for Common Entrance Test for the entry into the Physical Education courses. a. For B.P.Ed: Candidates should have appeared or passed three year degree examination recognized by any university in A.P. or any other university recognized as equivalent thereto and should have completed 19 years of age on 01.07.2018.
b. For U.G.D.P.Ed: Candidates should have appeared or passed Intermediate or equivalent course recognized by the Government of Andhra Pradesh and should have completed 16 years of age on 01.07.2018. Acharya Nagarjuna University, Guntur issued the Andhra Pradesh State AP PECET 2018 /Physical Education Common Entrance Test 2018 notification on the 16-03-2018 invited online applications from the eligible candidates for admission into BPEd and UG PED courses offered by the Universities and affiliated colleges in the AP state for the academic year 2018-2019 . AP PECET 2018 Entrance Test successfully conducted from 2018 and they are waiting for their results. 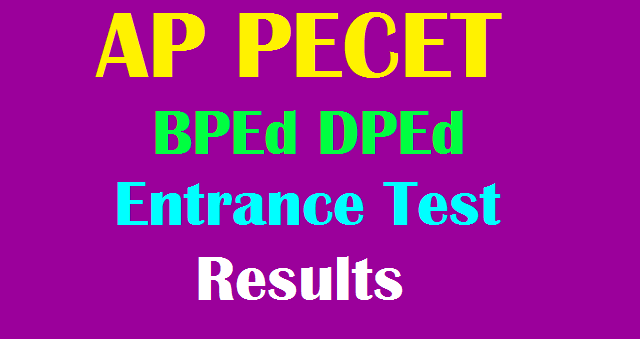 These results of PECET has been released and it has been placed on its official web portal http://www.appecet.org.in/ . Appeared candidates can get the results from here.